The 19th October 2013 was a perfect confluence of international celebrations as far as TrowelBlazers were concerned: International Day of Archaeology, the final day of Earth Science Week, and the end of a week events surrounding Ada Lovelace Day. Our contribution to mark all three of these things was to organise a Wikipedia editathon with the dual aims of improving wikipedia content about women in the geosciences and archaeology, and to increase the number of women editing wikipedia pages. 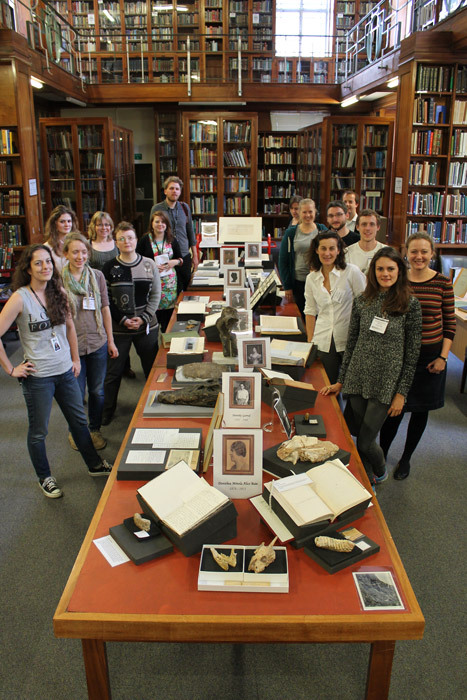 Display of fossils and archival material relating to NHM-linked pioneering women scientists. Those covered included: Mary Anning (1799-1847), Dorothea Bate (1878-1951), Dorothy Garrod (1892-1968), Barbara Yelverton Marchioness of Hastings (1810-1858), Elizabeth Cabot Agassiz (1822-1907), Helen Muir Wood (1831-1924), Elizabeth Gray (1831-1924), Mary Home Smith (1784-1866) and (Lucy) Evelyn Cheesman (1881-1969). With the help of the Natural History Museum’s wikimedian-in-residence John Cummings, I pulled together a whole day of activities that were open to anyone who was interested. Wikipedia training and time for editing, of course, but also a chance to meet historian Pamela Jane Smith (Dorothy Garrod expert) and writer Karolyn Shindler (Dorothea Bate’s biographer). On top of this Hellen Pethers, from the NHM library, and NHM curators Pip Brewer, Sandra Chapman and Zoe Hughes helped me put together a display of archival material and fossils collected by NHM-linked pioneer women scientists. This material is kept behind the scenes, so it was a rare and special opportunity not normally available to the general public. For more details read fellow Team TrowelBlazers member Brenna Hassett write-up for the British Geological Society, and Hellen Pethers blogpost on the NHM library blog. And the #TBwiki hashtag on twitter is well worth checking out for pictures and links from the day.